You probably are aware of the fact that medicinal mushrooms have been around, and you may not have heard about positive health benefits of them. If that is the case, then you have not come across a highly regarded brand, Four Sigmatic, that uses medicinal mushrooms which have been known to be helpful. You are about to learn about something new and possibly life-changing. The Four Sigmatic products feature mushroom coffee that provides some fantastic benefits for people when it comes to helping them clear their minds, and increases their focus, improved their concentration, and cognition. Additionally, these medicinal mushrooms improve memory and mood as well. Additionally, the mushroom coffee can help boost your immune system and reduce inflammation. However, if you are making a face because the idea of mushroom coffee is not appealing and hard to imagine how it , you will be pleasantly surprised to know that the Four Sigmatic coffees tasks absolutely delicious. And, you will not know that it is made of mushrooms! And, if you are a coffee lover, then you are going to be very happy to learn how the Four Sigmatic products can provide meet your health goals, while satisfying the desire to drink a cup of coffee. Before we delve into Four Sigmatic history and its products, lets learn a little about Mushrooms and their health benefits. Medicinal mushrooms aren’t the same as the culinary kind. We have known about the health-giving qualities of the latter for a while. Shitake, mitake, portobello, the cute little white buttons – they are all packed with phyto (or ‘plant’) nutrients, which are essential in our diets. In fact it is widely agreed that culinary mushrooms can help us maintain an ‘ideal’ anti-inflammatory, low sugar and high nutrient-dense diet. Certain edible mushrooms, such as shitake, pack a great meaty flavor that mimics meat, making them an excellent staple food for vegetarians. We all can and should work them into our daily recipes. Unlike the edible kind, medicinal mushrooms don’t grow on the ground – they grow on or near trees. Some actually look like tree bark. Others resemble something from a horror movie. Because you can’t really eat them raw, you need to extract the health benefits from mushrooms using a process. The main processes are by hot water extraction (i.e. boiling them) and alcohol extraction (soaking the mushrooms in alcohol). Medicinal mushrooms are frequently dried and sold packaged in either powder or capsule form (although some may be eaten raw). Both medicinal and edible mushrooms are considered useful as alternatives to medicine for treating age related disease. Coffee is the world’s most widely used antioxidant-rich superfood, and Four Sigmatic has given people an easy upgrade by introducing medicinal mushrooms to it. Thanks to the favorite medicinal mushrooms, now you can use coffee to boost your performance and metabolism, without straining your body in the process. Watch this video to gain some insight on Mushrooms and their health benefits. Now, lets learn about how Four Sigmatic and their products were established. In 2012, the idea of coffee being made of medicinal mushrooms started in Finland, as this Nordic country is known to be nature-centric as it is, and you already know it is known for its saunas. However, Finland also the country that is known to have coffee consumption which is the highest. And, after the 6 people who had the vision to bring the best out of medicinal mushrooms in a way that people would be receptive to, that is when the building blocks for Four Sigmatic had started. 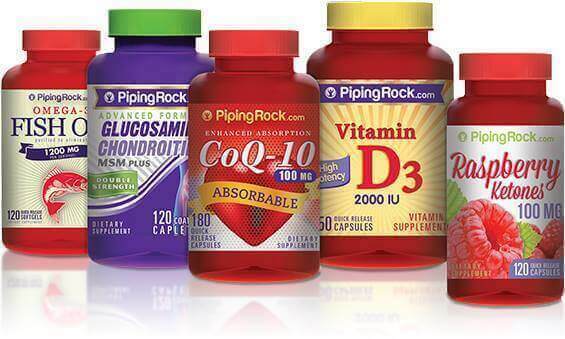 The belief started by the proven fact that dietary tweaks will improve the quality of anyone's life. And, they were well-aware that many people do not like mushrooms, and still found a creative way to make it appealing by using medicinal mushrooms to make delicious and nutritious coffee. Coffee that can help improve your mind, and your overall health. And, their business has been so successful that they had spread their offices from Helsinki Finland to LA, as well as in Minneapolis and Denver. They also have customers from over 65 countries and counting! The reason that people love the Four Sigmatic products is because they do love the taste, and they do love how clear-minded their products have made them, and have improved their concentration, focus, their mental health, and their overall health! This company features 5 unique products, and they are the Four Sigmatic Mushroom Coffee With Cordyceps and Chaga, Four Sigmatic Mushroom Coffee With Lion’s Mane and Chaga, the Mushroom Mocha With Chaga, Mushroom Hot Cacao with Reishi, and the Lion's Mane Elixir. The first product that will be reviewed is the mushroom coffee with cordycepts and chaga. 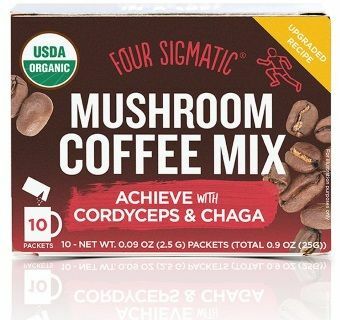 What is so special about Four Sigmatic Mushroom coffee with cordyceps and chaga? It is made with cordycepts, which is a potent mushroom which gives you a healthy energy boost. And, additionally, this coffee is made with chaga mushrooms that are known to strengthen the immune system. That said, this coffee will give anyone an excellent energy boost, and this is with half of the caffeine that is found in most traditional coffees. And, this coffee is made with other energy and immune system boosting ingredients as well. One of the other ingredients that is found in this coffee is Organic Eleuthero. Organic Eleuthero is a medicinal herb is also referred to as Siberian ginseng. It is found in Northeastern Asia. Organic Eleuthero has energy-boosting properties and supports your overall health. This herb has been used in Korean, Chinese, and Russian folk medicine for many years to help promote stamina. And, the other ingredient that is found in this coffee is simply organic instant coffee. The organic instant coffee is a non-GMO coffee that is grown in the Mexican highlands in volcanic soil. After the coffee beans have been roasted and brewed, it is modified into a powdered form. And, the powder is sent off to other laboratories in order for it to be properly tested for chemicals. Just be aware that this coffee does contain 50 mg of caffeine, which is again, half of what other instant coffees have. The Four Sigmatic Mushroom coffee with cordyceps and chaga is also very high in antioxidants which helps repair tissue damage. And, you do not have to worry about this coffee tasting like mushrooms. It is created in a way that it tastes just like freshly brewed coffee. 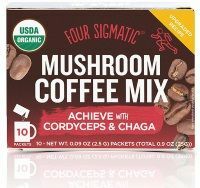 That said, the Four Sigmatic Mushroom coffee with cordyceps and chaga is a great weight loss aid. It does not add many calories even if you were to add the nut milk, ghee, or coconut oil. And, it provides you a lot of energy which you can use to burn up other calories during your workout. And if you are going through endurance training, then you can sip this coffee all day so that you have the energy for it. This Mushroom coffee with cordyceps and chaga is an instant coffee and is very easy to make. All you have to do is scoop a spoonful of coffee into your mug or thermos, and then pour hot water in it. It can be sweetened with a natural sweetener or almond milk, or any other type of nut milk. If you prefer the coffee to have a creamy texture, you can always add in ghee or coconut oil. The best time to drink this coffee is in the mornings or afternoons before you are going to go for your workout. That is because you will have the energy you need from this coffee without having to have consumed too many calories. Customers who have had this coffee say nothing but positive things about it as in their reviews, they stated that it gave them the energy that they needed. Additionally, it has kept them healthy. And now, let's take a look at another product that this company provides. That is the Four Sigmatic mushroom coffee with lion’s mane and chaga. 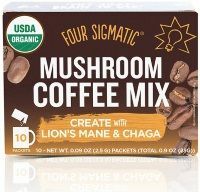 Another delicious coffee product from this company is the Four Sigmatic mushroom coffee with lion’s mane and chaga. This particular coffee not only provides you with the energy boost that you need to tackle your daily activities. However, it has properties that help you stay focused, and help you concentrate, and enhances your creativity. Let's look at the ingredients. The chaga mushroom is a medicinal herb that has been used to boost your immune system, which was already discussed in the review of the Four Sigmatic Mushroom coffee with cordyceps and chaga. This coffee is made with the Lion's Mane mushroom which is a great enhancer for cognition, focusing, and concentration. This mushroom is non-GMO and organic and is free from any kind of fillers or toxins. This coffee helps improve your concentration as well because the Lion's Mane mushroom extract is supported by the Rhodiola ingredient. The Rhodiola roots grow in Tibet and have been used for thousands of years as a medicinal herb to help improve concentration. It is also a memory booster, so you will start to remember why you walked into a particular room after drinking this coffee. And, it does taste just like any other coffee. That is because the other ingredient in this product is organic coffee. This organic coffee is grown in the Mexican highlands and has been sent off to laboratories to be tested for any toxins or chemicals. This coffee is vegan and non-GMO. However, be aware that it contains 50 mg of caffeine which is half of what a cup of typical instant coffee contains. Mushroom Coffee With Lion’s Mane and Chaga is just as easy to prepare as instant coffee. All you need to do is take a spoonful of the Four Sigmatic mushroom coffee with lion’s mane and chaga and put it into your cup. Then, pour hot water into it, and mix it up. You can add natural sweetener or nut milk in it to enhance the flavor. And, if you like it creamy, then you can always add ghee or coconut oil to give it that creamy texture. This is the perfect coffee to drink if you are going to be spending a lot of time at work to go over complex projects that would require your undivided attention and focus. Also, if you are planning to take exams, then you will want to drink a cup of this coffee before you start writing it. You can also drink this coffee before your classes as well so you can focus and concentrate better. If you have ADHD and are on medication for it, do not replace that with this coffee. And, if you are on ADHD medication, you will need to consult with your doctor before ordering this coffee. The ingredients are herbal and natural, however, they can interact with other drugs. And, this company offers more exciting coffees and products as well. In fact, the next product that is about to be reviewed is truly delicious. That is the Mushroom Mocha With Chaga. The Four Sigmatic Mushroom Mocha With Chaga will be one of the best treats you will have. That is because it is very sweet, and it only contains 1 gram of sugar per serving. However, because of the fact, it is so sweet, you would never know that. Before we go over the ingredients of the mushroom mocha with chaga, let's talk about the benefits. This treat will not only help to boost your immune system due to the fact that it is high in antioxidants and in immune-boosting properties, but it is a delicious treat that you can indulge in and won't have to feel guilty about it. The Four Sigmatic Mushroom Mocha With Chaga is composed of the immune-boosting chaga mushrooms. These chaga mushrooms were a great coffee substitute during WWII when coffee beans had to be strictly rationed. It also has organic instant coffee that is grown in the highlands of Mexico. Additionally, there is also organic cocoa powder in the mix that is processed in the most minimal way possible, and this cocoa is grown in the mountains in Peru. And, this amazing drink is sweetened naturally with organic coconut palm sugar. It has many amazing minerals and is sweet like refined sugar, and it only has 1 gram of sugar. And, it is also sweetened with organic stevia to offset the bitter taste from the other ingredients. Additionally, it is calorie-free, and the stevia is a top-quality concentrated extract that cancels out the metallic aftertaste that you may find that stevia leaves you. That said, this healthy mocha is a treat that you do not need to feel guilty with enjoying. Instead of going to your local coffee shop to get a mocha or a frappuccino that is loaded with fat, calories, and sugar, that can easily increase your chances of ending up with type 2 diabetes- you can indulge in this treat instead. 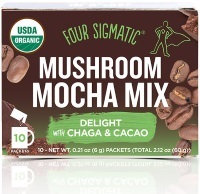 In fact, many reviewers of this product have said that the Four Sigmatic Mushroom Mocha With Chaga tastes like a chocolate treat and it not overly sweet. That said, if you have a chocolate craving, this product will certainly satisfy it. Additionally, you will not only get the same satisfaction due to how wonderful it tastes but unlike the times after drinking a sugar-filled frappuccino, you will not feel tired and heavy due to the carb overload. You are going to feel great and energized. Just keep in mind that there is 50 mg of caffeine in each serving, which is again, half of what you will get in traditional instant coffee. You can always enhance the sweetness of the drink by adding some nut milk or some natural sweetener if desired. However, this drink has so many naturally sweet properties that it may not really be necessary for you to do. But that is up to your personal taste. Now, let's take a look at another wonderful product from Four Sigmatic, and that is the Mushroom Hot Cacao with Reishi! This product may not be coffee but it is an incredibly healing hot cocoa. In fact, you will want to skip the high- calorie dessert and drink a cup of Mushroom Hot Cacao with Reishi instead! First of all, one cup of this amazing hot cacao is only 25 calories, and how can you go wrong with that? You can enjoy the sweetness that hot cocoa bings without the guilt. What makes the Mushroom Hot Cacao with Reishi so incredible is the ingredients that it is made of. The top ingredient that comes with this drink is that it contains the healing mushroom, Reishi. Reishi has been known to help you sleep, and helps you combat stress. In fact, the Reishi mushroom was believed to be a divine fungus and has been regarded as the regal fungus, the mushroom of spiritual potency, and has been called the ruler of herbs. However, one drawback of the Reishi mushroom is that it is quite bitter. But the good news is, organic coconut palm sugar and organic stevia are included to offset the bitter taste that is associated with the Reishi mushroom. There are also other amazing ingredients that are in this drink such as organic cardamom. The organic cardamom is an Ayurvedic spice that has been used in Ayurveda practices to help aid digestion. That said, this drink is good for your stomach! It also comes with organic cinnamon. This cinnamon is not processed so you can enjoy the healing benefits. This spice has been known to level out blood sugar values and also stops you from having an unhealthy sugar craving. And, last but not least, this drink contains that organic cacao powder that grows on the Andes in Peru. That said, you can enjoy a treat that is only 25 calories, and that has only one gram of sugar. You will want to drink this an hour before bed so it helps you get a good night's rest. You can drink more of it on those days that are bringing you more stress. It is a much better option than you turning over to high-calorie sugary and fatty foods for comfort eating. It is so easy to prepare as well because all you need to do is pour the powder into a cup, and then add hot water, and mix it up. In order to enjoy some sweetness in your smoothie, you can sprinkle some of the powder, and you can even use it as a baking ingredient. If you want to have a thicker consistency, you can always mix in ghee or coconut oil. And, if you want to add sweetener to this, you can always add in nut milk or natural sweetener. And then you have the delicious hot cocoa beverage that will help you sleep, calm down, and you don't need to feel any guilt. 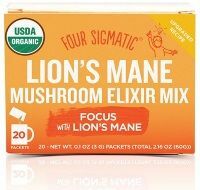 Now, let's talk about the next product from Four Sigmatic, and that is the Lion's Mane Elixir which you will be delighted to know about. If you are looking for a sweet and healthy drink, then Four Sigmatic's Lion's Mane elixir is going to give you exactly what you want and need. The Lion's Mane Elixir is filled with so many health-benefits, and potent and healing ingredients, and tastes amazing. The ingredients that make up the Lion's Mane elixir are not only the healing organic mushroom the Lion's Mane which is filled with antioxidants and important properties to help you function on any given day. However, it is also composed of organic rose hips that are rich in Vitamin C which helps boost your immune system and can repair tissue damage. This drink has organic Rhodiola which is referred to as The Golden Root which helps boost your memory, focus, and concentration. The drink is also sweetened by organic stevia as well as by organic mint. The mint taste in the drink is subtle and that is from the peppermint leaf. And, it is so easy to prepare the elixir as all you need to do is pour it into a cup, and then add hot water. You can also add it to tea or coffee if you choose. If you want to enhance the taste by adding extra sweeteners, you can always add in natural sweeteners as well as nut milk if you prefer. If you want to have a creamy texture added to the elixir, then you can always add ghee and coconut oil. You will want to drink the Lion's Mane elixir in the morning or in the early afternoon. That is because this is the time when you need to have your concentration up to par. And, if you have an exam or a test to take, you will want to drink this beverage before you take it so you can stay focused. Or, if you are having one of those days when you have a difficult time concentrating for whatever reason, you can drink several servings of Lion's Mane elixir. There is also 18 mg of Vitamin C per serving, which comes from the organic rose hips. That also said, if you feel like you have a cold or flu coming on, then you will want to drink a few servings of this beverage in order to boost your immune system so you can fight it off. This is the perfect choice of a hot drink if you do not want coffee or if you do not want a mocha or a hot chocolate. Not to mention, the Lion's Mane elixir is incredibly delicious and sweet, with a hint of minty flavor. Now that you are aware of the 5 amazing products that are made by Four Sigmatic, you have choices of what you can choose from based on what your mood happens to be. There are times that we want to find comfort by enjoying a hot drink while we relax on our favorite sofa or in bed. Not to mention, you cannot go wrong with any hot drink that provides so many healing benefits. However, you will want to make sure if any of the Four Sigmatic products are going to be a safe option for you. Even though the ingredients in all of the Four Sigmatic products are natural and healing, there are many considerations you need to make before purchasing any of the products. If you have an allergy to mushrooms or to any of the properties that are in any of these products, then you won’t be able to consume any of it. You can also do a patch test or to go to your allergist to determine if you have an allergy to any of the ingredients. You will also need to consult your doctor if you are planning to get pregnant, are pregnant, or breastfeeding. Tell your doctor which product you want to purchase and list the ingredients. This way, you are given the green light if it is safe for pregnancy or not. Also, if you develop any rash, hives, or any other distressing symptom from drinking any of these drinks, then stop immediately. However, if none of these apply, then you can go and enjoy the amazing products by Four Sigmatic. How, let’s look at some of the alternatives to Four Sigmatic and make comparisons. Life Cykel - Life Cykel Mushroom coffee is an Australian based company that makes a variety of mushroom coffee blends. And, they also have highly potent ingredients that are healing. However, the coffee has been said to be a little more bitter than the Four Sigmatic products, and it is very expensive to ship to anywhere else in the word since it is based in Australia. NeuRoast - NeuRoast is a brand of mushroom coffee which has a number of healing elements as well, and is even more potent than Life Cykel's coffee. However, the caffeine amount is a little higher in each serving, and NeuRoast is also more costly than Four Sigmatic products. That said, you are better off with saving you money! Wild Foods Co. - Wild Foods Co. does not sell mushroom coffee per se, but they provide cold brew or regular coffee in addition to mushroom powders that you can mix with it. That said, this product may be quite good but there is a lot more work into preparing the coffee. Additionally, the coffee they provide is much higher in caffeine as well than the Four Sigmatic coffees. There is a decaf option as well but that is not nearly as tasty. And, Wild Foods Co. coffee is more expensive than the Four Sigmatic products as well. Now that you know everything you must about the Four Sigmatic products, you are now wondering where you can purchase it! You can purchase Four Sigmatic products on Amazon, and you can find many specials and discounts on Amazon sites. However, if you want to take full advantage of any special sale or discount, then you are better off with buying any of the products from the Four Sigmatic website. In fact, if you purchase any of their products from their website directly, you are entitled to 20% off and free shipping if you become a member. If you become a member, you will be entitled to amazing perks and discounts, and maybe even freebies down the road. You will need to read their newsletters in order to find out what is new because something exciting may come along the way. Shop now for Four Sigmatic Mushroom Coffee at Amazon and get 20% Off your order when you Subscribe and Save (5% off) and apply Four Sigmatic Coupon (15% Off) before adding the item to the cart! I am sure you love coffee, mochas, and hot chocolates, or pleasant tasting hot drinks, yet at the same time you want to stay healthy- then the Four Sigmatic products are perfect for you. Thanks to the favorite medicinal mushrooms, now you can use coffee to boost your performance and boost your metabolism, without straining your body in the process. You not only will cut down on calories, fat content, and caffeine but you will also be getting great health benefits that will boost your immune system, energy levels, concentration, mood, and your focus. Additionally, these products are delicious and sweet, and you will be able to satisfy any sweet tooth craving as well. That said, what are you waiting for? Try your Four Sigmatic product today!